Devil’s Slide Coast is an 8,900-acre network of publicly accessible lands located between Pacifica and Half Moon Bay. Explore diverse landscapes including dramatic ridgelines, bluffs, beaches, tidepools, historic sites and crucial ocean habitats. Devil’s Slide Tunnel is open on scenic Highway 1 and construction of parking lots and other amenities to support the new Devil’s Slide section of the California Coastal Trail is now complete! With the opening of the new Devil’s Slide Coastal Trail along the old stretch of highway, this portion of the Coast has been made accessible in new and exciting ways, offering opportunities for hiking, horseback riding, cycling, surfing, fishing or simply viewing from one of many scenic overlooks. The wonders of Devil’s Slide Coast represent a collaboration among conservation agencies, nonprofit organizations, and local groups that have worked to protect this precious coastal resource and make it available for all to enjoy. Information about hiking trails in the San Francisco Bay Area. Coastwalk provides resources for California Coastal Trail users including maps, podcasts and information that will enhance users’ experience. History comes alive at the San Mateo County History Museum. Visitors can discover the past through hands-on school programs, interactive exhibits and a wide range of events for both adults and families. This website is made possible by collaboration among the National Park Service, California State Parks, San Mateo County Parks, California Coastal Conservancy, Golden Gate National Parks Conservancy, Midpeninsula Regional Open Space District, and Peninsula Open Space Trust. These agencies and organizations work together with other local groups to protect and steward the public lands of this unique California coastal area and to enhance public access, recreational opportunities and community participation. Stretched across 80,000 acres north and south of the Golden Gate Bridge, the Golden Gate National Recreation Area constitutes one of the world’s largest national parks in an urban setting. Our mission is to preserve and enhance the natural, historic and scenic resources of these lands for the education, recreation and inspiration of people today and in the future. In the spirit of bringing national parks to the people, we reach out to a diverse urban community, promote the richness and breadth of the national park system to many who are experiencing a national park for the first time and foster broad-based public stewardship through various volunteer and partnership programs. The mission of the Parks Conservancy is to preserve the Golden Gate National Recreation Area, enhance the park visitor experience, and build a community dedicated to conserving the parks for the future. We are a community-supported nonprofit organization transforming places—and people—through conservation and improvement of these remarkable national parks. We are dedicated to protecting these PARKS, making them relevant and accessible FOR ALL communities, and instilling a sense of stewardship in this and future generations to ensure their vitality FOREVER. Join us as we work toward our vision of PARKS FOR ALL FOREVER. California Department of Parks and Recreation manages more than 270 park units, which contain the most diverse collection of natural, cultural, and recreational resources to be found within California. Responsible for almost one-third of California’s scenic coastline, state park units include underwater preserves, reserves, and parks; plant and wildlife reserves; state beaches, recreation areas, wilderness areas, and reservoirs; state historic parks, historic homes, museums, visitor centers, and lighthouses. Our workplace consists of nearly 1.4 million acres, with over 280 miles of coastline; 625 miles of lake and river frontage; nearly 15,000 campsites; and 3,000 miles of hiking, biking, and equestrian trails. Friends of Santa Cruz State Parks is an entrepreneurial nonprofit sustaining the legacy of our state parks and beaches. Through an innovative partnership with California State Parks, and by leveraging local community support, Friends has provided millions of dollars of funding for educational programs, visitor services and capital projects in Santa Cruz and San Mateo counties. Founded in 1976, Friends is passionately dedicated to the preservation of our spectacular natural environment and rich cultural history. The Department manages parks, trails and historic sites to preserve public lands and provide opportunities for education and recreation. The system’s 18 parks, regional, county, and local trails, and two historic sites are located throughout the County and encompass more than 16,000 acres. The Parks represent the region’s wondrously diverse natural settings, from rugged tidepools, lush mountain forests, and remote campsites to Bayfront shoreline, sunny picnic areas and popular playgrounds. The Midpeninsula Regional Open Space District is a regional greenbelt system in the San Francisco Bay Area. It is comprised of over 61,000 acres of land in 26 open space preserves protected for public enjoyment, making a preserve system of diverse and unparalleled beauty in one of the largest metropolitan areas in the country. The District also participates in cooperative efforts such as the Bay Trail, Ridge Trail, and Skyline-to-the-Sea Trail, which are regional trail systems in the Bay Area that include District lands. The California Coastal Conservancy is a state agency that preserves, protects and restores the natural environment of the California coast and San Francisco Bay. The Conservancy builds trails, restores wetlands, preserves coastal farm and forest land, invests in working coastal waterfronts, and helps people get to and enjoy the natural lands along the coast and around San Francisco Bay. Working with local agencies and nonprofit organizations, the Conservancy has helped open more than 100 miles of coast and bay shores to the public and preserve more than 300,000 acres of wetlands, wildlife habitat, parks, and farmland. The Pacific Land Trust is a nonprofit organization that preserves and enhances the natural, cultural and historic environment of Pacifica and surrounding communities. In partnership with the Coastal Conservancy and the City of Pacifica, the Land Trust engages the public in helping to care for and learn about the 246-acre park at the Pedro Point Headlands. The Pedro Point Headland’s website www.pedropointheadlands.org includes a map of the Headlands trails, as well as notices of upcoming public volunteer events. 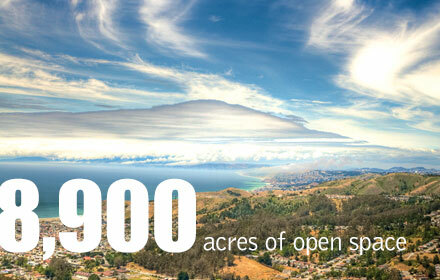 Peninsula Open Space Trust, a private, nonprofit land trust, protects and cares for open space, farms and parkland in and around Silicon Valley. Since its founding in 1977, POST has been responsible for saving more than 70,000 acres as permanent open space and parkland in San Mateo, Santa Clara and Santa Cruz counties. These lands are now part of the National Park System, National Wildlife Refuge System, California State Parks, county and city parks, regional preserves and private farmland. They are places of natural beauty and abundance that have come to define our region.